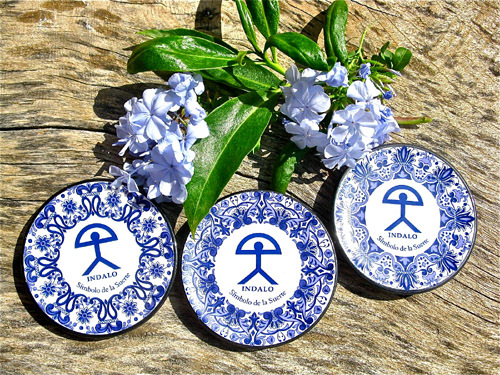 These small, blue-and-white plates feature the lucky Indalo, recognised in Spain as a symbol of protection and good fortune. People who are lucky think positively, look for opportunities and are always open to possibilities. Send someone your good luck wishes with one of these beautiful Spanish blue-and-white ceramic plates / wall plaques. It can be displayed on a wall or in a cabinet, or form part of a collection. Because each is handmade, the decorative patterns around the edges of the plates vary a little. Detail: The plate measures 9cm in diameter and bears the words INDALO - Símbolo de la Suerte which is the Spanish for "Symbol of good luck". They are handmade in Spain and there is a hole on the back for hanging. This would be a great gift to pass on your good luck wishes - along with a bit of Mediterranean charm. A little something for him or her - a retirement gift, house moving present, Xmas gift . . for women or men, to show that you are thinking of them, and that you care about their well-being. Comes gift-wrapped, like all our presents (with an information card about the Indalo) - and we can print a personal message on your behalf.